I've got bikes that take either the Schrader or Presta tire valves. Rather than having to maintain two types of tire pumps. I just slip this adapter on the Presta value and use my Schrader pump. Makes life easier, when you have a tire mishap. Small enough to fit in your tire repair kit. Update on these values from earlier review. I've tried the same valves from 3 local stores. All suffer the same issue when used with a compressor, or at least my 12v compressor. Using plumbers tape on the Schrader end creates an effective seal. The problem is the thread is too short on the Schrader end for a compressor when there is a constant pressure. A slightly longer thread would create an effective seal and be faster than having to use plumber's tape each time. These do work very well with floor and manual pumps. Since I purchased these to work at gas stations (and I have the same problem at gas stations that I have with my compressor at home) I can't really give these a good rating. I'll have to go back to the Diamondback brass adaptors, for the time being. Now, if someone can add this to my previous post, instead of being a new post, it would be great. Not so good for me. I purchased 5 of these on the only review. All 5 failed to seal, failing at 60 psi. I don't know the brass type I had before but I'll be getting them before using this again. 60psi is just too low for my 10mile (16km) commute. It is what it is -- the fix for a pump with a lousy Presta connector, the fix for when you should have bought the longer valve stem tube, what you have to have for gas station air on the road or using an inflator at home. Valve adaptor for presta to schraeder. I use it when filling tubeless tires with my compressor when mounting them. It does what it's supposed to. Not much more to say about this item. Super accessory to adapt any pump to your bike tires. Fits all the pumps I use so they work on my Presta bike tires. Couldn't be happier with the adapter, it's simple and works exactly like it should. Low quality, but they don't leak. These adaptors work, but need more quality control. I ordered two and they both fit on the presta valves and don't leak. I had some troubles getting the little latch on the tire inflator to catch the bottom of the threads. On both of the adaptors, the pitch and depth of the outside threads were off in different directions, I tried to put valve caps over tops of them after sealing the presta valves, one would barely hold a cap, the other wouldn't let me screw on one at all. The aluminum is also a rather soft alloy showing lots of wear. Would not buy again, go for something higher quality. I have 4 other adapters I have picked up from bike shops, and from Wall Mart. They don't work with a compressor. This one dose! Works!! Just leave it on your bike and you're good to go! Y , Did I need this at all???? 0 of 17 customers found this review helpful. This should have been part of that type of tube,,, DUDE!!! This is a big waist of my time and MONEY !!!! These adaptors made putting air in my tires easy. My wife loves them. The presta valves are good but they were a problem for my wife. Presta, Shraeder, Shraeder, Presta, why can't they make up their minds? 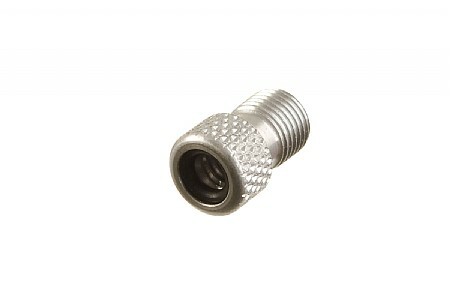 If you have presta valves this is a handy adapter to have. Its a valve adapter, whats not to work. Its kinda cool that it's aluminum instead of brass so it matches my titanium frame.